Rev. 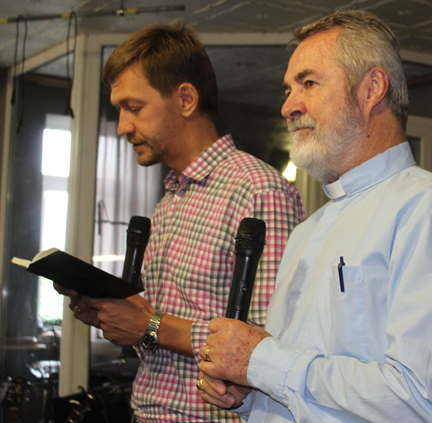 Dr. Leonardo Neitzel (right) preaches in Ukraine through a translator, LCC missionary Rev. Oleksiy Navrotskyy. LCC’s retiring mission executive reflects on his years of service. Throughout his epistles the Apostle Paul does not tire in giving thanks to God even under persecution, imprisonment, unnumbered hardships, trials, and health problems. The Holy Spirit nurtured in him a positive outlook of the Kingdom’s work, and he encourages us with the same attitude today: “Give thanks in all circumstances, for this is God’s will for you in Christ Jesus.” (1 Th 5:18). Paul can say this based on his own life experience and ministry that was a mixture of joys and challenges. At one time he was “chained” in spiritual blindness, bearing its marks, under the devil as his master. From the day Jesus called him, changing his life on the road to Damascus, he was free, bearing Christ’s marks as his new Master – marks of his personal salvation. As a result, he bears physical marks for the salvation of many – scars imprinted by hardship and persecution (see 1 Cor. 4:9-13; Gal 6:17). Speaking about his credentials as an apostle, he concludes: “To the weak I became weak, to win the weak. I have become all things to all men so that by all possible means I might save some” (1 Cor 9:22). Historically, in one or another way, prophets, apostles, evangelists and messengers of Christ’s Good News go through similar experiences – a mix of great joy amid hardships. Jesus says: “In this world you will have trouble. But take heart! I have overcome the world.” (John 16:33). With this perspective, and on the verge of retirement, I share some of my experiences serving as Lutheran Church–Canada’s Assistant to the President for Missions and Social Ministry Services since 2009. There are so many blessings to report, but here are some highlights. • resilient church leaders holding on to God’s grace in difficult times such as war in Ukraine, conflict in Cambodia, political unrest, earthquakes in Central America, and other natural disasters. As we serve the Lord we become aware of our own weaknesses but also His strength! • not being able to do more to address personal and shared frustrations regarding complacency and a lack of commitment to God’s missions given the harvest at hand and the rich potential of human and material resources available in LCC. • long time taken or required for indigenous churches to move towards self-supporting churches. • formation of four ethnic pastors and one site-specific pastor through LCC’s Pastors with Alternate Training program (PAT) and seven more set to complete their studies in the near future. • ongoing project sponsorship by CLMS, LWMLC, congregations and individuals by God’s grace. • keep the vision and focus of pastors, congregations, organizations, seminaries, and individuals proactive for the sake of Christ’s mission in Canada and abroad. • encourage men and heads of households to take their stand as Christ’s servants, joining the women as faith incubators, nurturing the family in God’s Word and witnessing to Christ in families and communities. • give thanks for continued countless blessings from sowing of God’s Word under His promises: “So is my word that goes out from my mouth: It will not return to me empty, but will accomplish what I desire and achieve the purpose for which I sent it” (Isa 55:11-13). By God’s grace, LCC’s mission work, although imperfect and facing challenges, has continued with the help of an army of faithful assistants—His people. I thank and praise our Lord for the opportunity to serve in this capacity knowing it is He alone who works in us what pleases Him for His purpose. Whatever we do in God’s mission should be ultimately done in gratitude for Christ’s love – to the glory of His name, for the well-being and salvation of people, and the expansion of His kingdom. Rev. Dr. Leonardo Neitzel is retiring as Lutheran Church–Canada’s Assistant to the President for Mission and Social Ministry Services. I will miss not working with you, Rev Neitzel. You truly accomplished a lot in your office. My regret is that you were so hard on yourself when others thought you were accomplishing much under difficult circumstances. I learned to ask for the “entire” story because for every situation you faced, there were multiple levels. You leave a big gap but I know God has found a new place for you and Maria. Well done, good and faithful servant! Thanks be to God for your faithful service to the Lord and His Church these many years. Your energetic dedication to seeing God’s kingdom come on frontline missions outside Canada has been a rich blessing to those missions and a blessed reminder to us at home that the Church really does extend outside our walls. Each member of the body of Christ draws its life and strength from our dear Lord Christ, the Head of the body. Caring for others at a distance renews our care for the people nearby. May God richly bless you and yours as you retire, Dr. Neitzel.